5685 MAQ SOUTH KOREA (1964) UNESCO Building*. 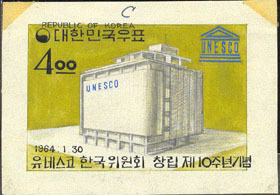 Unaccepted design in watercolor on carton for UNESCO 10th anniversary. 14 x 10 cm. Adhesions on back from mounting. Scott No 429, Yvert No 331. 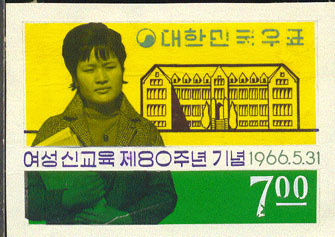 10063 MAQ SOUTH KOREA (1966) Woman*. Ewha University*. Unaccepted design in watercolor on carton for 80th anniversary of modern education for women. 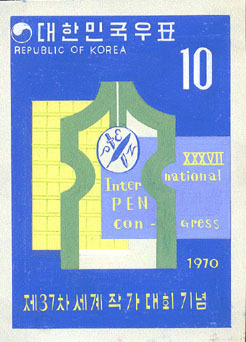 11.2 x 8.2 cm. Mounting adhesions on back. From the archives of the head of the stamp design department. Scott No 512, Yvert No 414. 4600 MAQ SOUTH KOREA (1967) People*. Unaccepted design in watercolor on carton for World Anti-Communist League. 11.3 x 8.3 cm. Mounting adhesions on back. Scott No 587, Yvert No 464. 5673 MAQ SOUTH KOREA (1968) Hands* holding picture*. Unaccepted design in watercolor on carton for Human Rights 20th Anniversary issue. 11.3 x 8.3 cm. Mounting adhesions on back. Scott No 627, Yvert No 517. 5674 MAQ SOUTH KOREA (1968) Circles* surrounding stylized globe*. 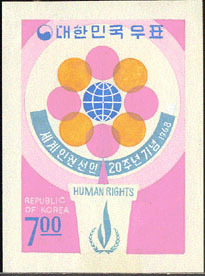 Unaccepted design in watercolor on carton for Human Rights 20th Anniversary issue. 8.5 x 11.5 cm. Mounting adhesions on back. Scott No 627, Yvert No 517. 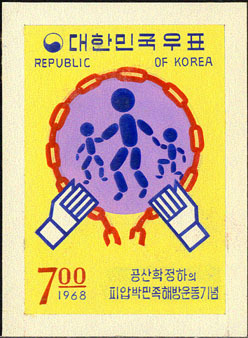 10572 MAQ SOUTH KOREA (1968) Hands holding chains around stylized people*. Unaccepted design in watercolor on carton for movement to liberate poeple under communist rule. 8.5 x 11.5 cm. Mounting adhesions on back. From the archives of thehead of the stamp design department. Scott No 606, Yvert No 496. 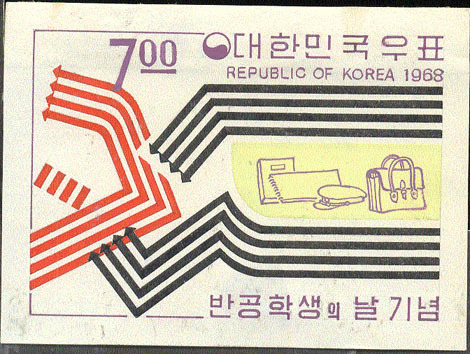 10573 MAQ SOUTH KOREA (1968) Lines with arrows*. Student paraphernalia*. Unaccepted design in watercolor on carton for anti-communist student uprising. 11.2 x 8.3 cm. Mounting adhesions on back. From the archives of the head of the stamp design department. Scott No 626, Yvert No 519. 10435 MAQ SOUTH KOREA (1969) Factory*. Spoon holding some kind of nut?. Unaccepted design in watercolor on carton for 2nd 5 year plan. 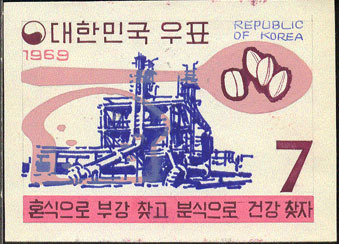 11.2 x 8.2 cm. Mounting adhesions on back. From the archives of the head of the stamp design department. Scott No 574. 10436 MAQ SOUTH KOREA (1969) Factory*. Cogwheels*. Bowl holding some kind of nut?. Unaccepted design in watercolor on carton for 2nd 5 year plan. 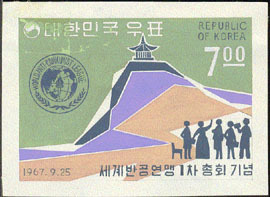 11.2 x 8.2 cm. Mounting adhesions on back. 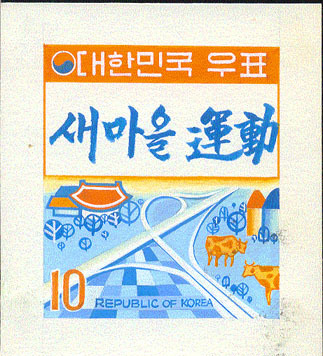 From the archives of the head of the stamp designdepartment. Scott No 574. 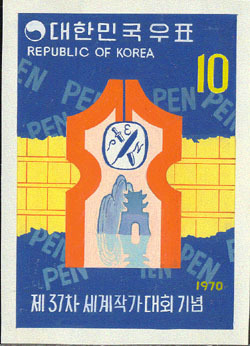 5024 MAQ SOUTH KOREA (1970) Postal zones*. Unaccepted design in watercolor on carton for Introduction of postal zone codes. 9.2 x 12.2 cm. Mounting adhesions on back. Scott No 712, Yvert No 595. 9424 MAQ SOUTH KOREA (1970) Feather* breaking sword*. "PEN"*. Unaccepted design in watercolor on carton for 37th International P.E.N Conference. 10.7 x 14.6 cm. Mounting adhesions on back. From the archives of the head of the stamp design department. Scott No 710, Yvert No 593. 9425 MAQ SOUTH KOREA (1970) Feather* breaking sword*. "PEN"*. Unaccepted design in watercolor on carton for 37th International P.E.N Conference. 10.6 x 14.7 cm. Mounting adhesions on back. From the archives of the head of the stamp design department. Scott No 710, Yvert No 593. 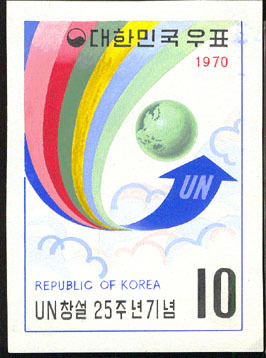 11771 MAQ SOUTH KOREA (1970) Rainbow ending in arrow*. Globe*. 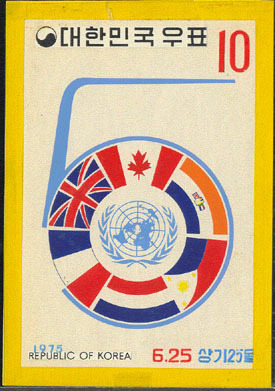 Unaccepted design in watercolor on carton for 25th anniversary of UN. 10.8 x 14.9 cm. Mounting adhesions on back. 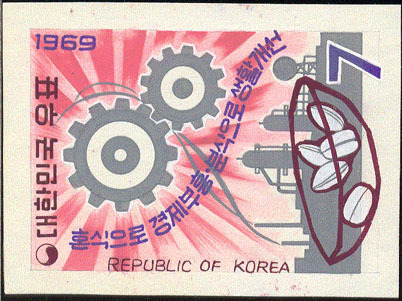 From the archives of the head of the stamp design department.Scott No 734, Yvert No 605. 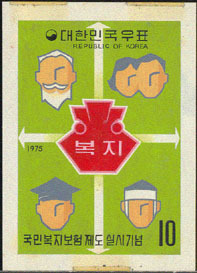 10075 MAQ SOUTH KOREA (1972) Stylized person inside globe*. 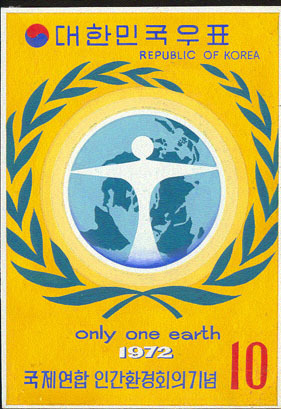 Unaccepted design in watercolor on carton for UN Conference on Human Environment. 9.7 x 13.5 cm. Mounting adhesions on back. From the archives of the head of the stamp design department. Scott No 825, Yvert No 709. 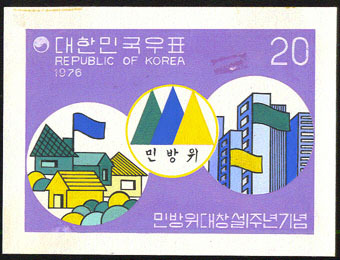 4127 MAQ SOUTH KOREA (1975) Flags of various nations*. 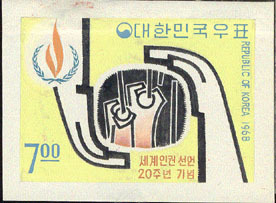 Unaccepted design in watercolor on carton for 25th anniversary of Korean War. 11.5 x 16.5 cm with clear acetate overlay for wording. Mounting adhesions on back. Scott No 977, Yvert No 850. 5100 MAQ SOUTH KOREA (1975) Medical professionals*. 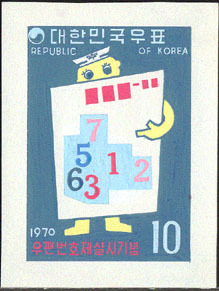 Unaccepted design in watercolor on carton for 70th anniversary of Korean Red Cross. 8.3 x 11.55 cm. Mounting adhesions on back. Scott No 999, Yvert No 883. 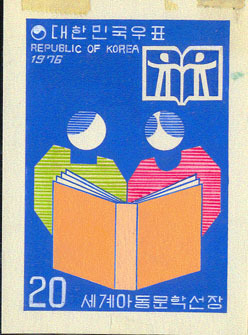 9881 MAQ SOUTH KOREA (1976) Stylized children reading book*. Unaccepted design in watercolor on carton for books for children. 8.4 x 11.4 cm. Mounting adhesions on back. From the archives of the head of the stamp design department. Scott No 1044, Yvert No 922. 11135 MAQ SOUTH KOREA (1977) Buildings*. Triangles with inscriptions*. Unaccepted design in watercolor on carton for 10th anniversary of science day. 11.3 x 8.4 cm. Mounting adhesions on back. From the archives of the head of the stamp design department. Scott No 1057, Yvert No 946.